The very densely populated metropole Hong Kong intends to decrease its energy intensity. The building sector accounts for a significant proportion of electrical energy consumption, mainly because of a high air conditioning usage. Buildings for commercial, institutional and residential use in Hong Kong offer many opportunities in energy saving. 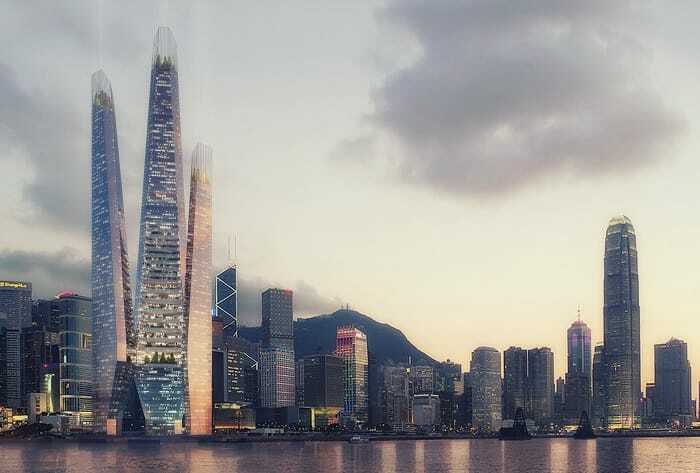 To address this challenging task, WestonWilliamson+Partners designed a green high-rise oasis for Victoria Harbor situated between Hong Kong Island and Kowloon in Hong Kong. Chris Williamson wrote to ECOURBANHUB: “Having won an international competition for this project we have continued to develop the idea as part of our office research projects primarily looking at the relationship between good efficient public transport and creating sustainable lovable civilised cities.”. The recently unveiled Arcology Tower is 440 meter high and provides a self-sufficient, self-sustaining vertical neighbourhood. The main functional zones, like offices and commercial space in the lower levels, an agricultural zone in the intermediate levels and residential apartments in the upper levels, spread across 250,000 square meter. Many residential wintergardens support the regulation of the internal climate and provide little green wellness oasis with a view over the Victoria Harbour. According to WestonWilliamson+Partners, agricultural terraces are planned for the cultivation of food to be consumed within the building. 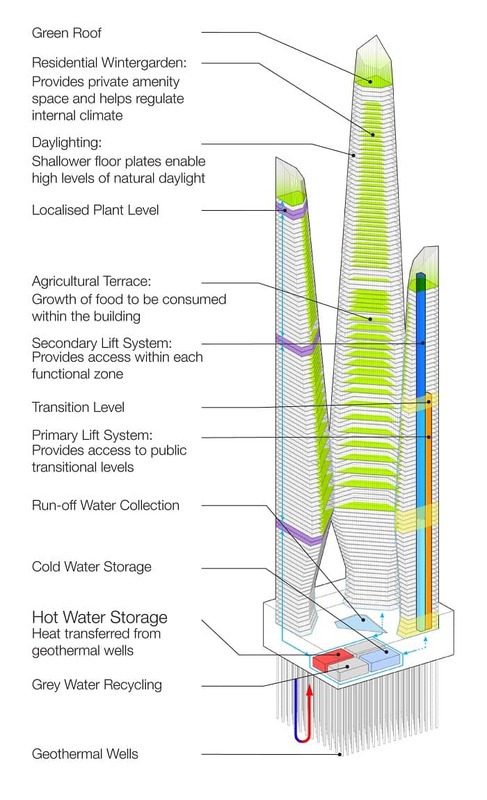 The hot water stored in the basement of Arcology Tower is heated with geothermal wells. The transport within the building is split. 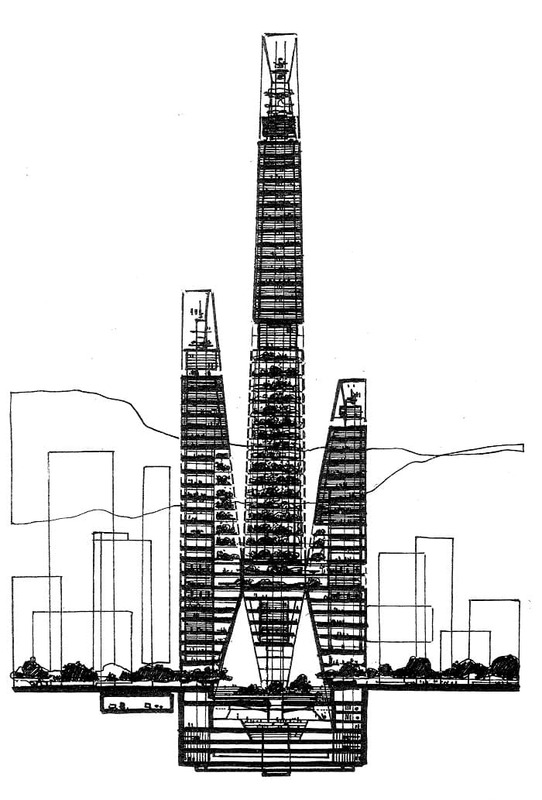 A primary lift system serves several public nodes situated between the functional zones in each tower. A secondary lift system runs from these public nodes and enables shorter journeys within each functional zone. It also keeps journey times to a minimum. WestonWilliamson+Partners states, that the public nodes provide a range of retail, recreational and social spaces which offer all the amenities required to generate a dynamic and thriving community. The nickname “Kissing Tower” is due to the inward angle between the twenty-first floor and twenty-fifth floor. There, access to each of the three towers is possible. WestonWilliamson+Partners is a London based architectural firm and founded in 1985 by Chris Williamson and Andrew Weston. Their broad range of services include urban design, architecture, masterplanning, passenger modelling, and product design. WestonWilliamson+Partners worked on various British and global projects. They also maintain offices in the Australian cities Melbourne and Sydney.